'9/11 Commission' Leaders: Nation's Security Isn't What It Should Be : The Two-Way While they believe "our country is undoubtedly safer and more secure than it was a decade ago," the co-chairman of the 9/11 Commission warn today that some of their panel's most important recommendations remain unfilled. While they believe "our country is undoubtedly safer and more secure than it was a decade ago," the co-chairman of the 9/11 Commission warn today that some of their panel's most important recommendations remain unfilled. And because of that, "we fail to achieve the security we could or should have," say former Indiana Rep. Lee Hamilton (D) and former New Jersey Gov. 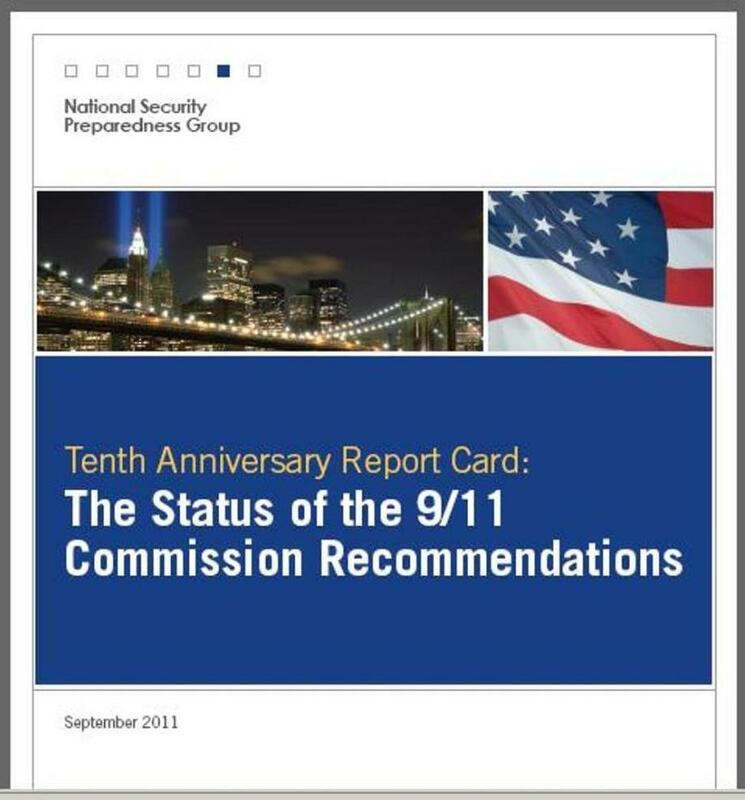 Thomas Kean (R), who with other leading national security experts today released a Tenth Anniversary Report Card: The Status of the 9/11 Commission Recommendations. The new report says that, "a decade after 9/11, the nation is not yet prepared for a truly catastrophic disaster." It warns, for example, that there still isn't "unity of command and effort" in responding to national emergencies. The recommendation that the radio systems first responders use be assigned to a spectrum that will allow them to effectively communicate "continues to languish," according to the report. While the commission recommended creation of a Privacy and Civil Liberties Oversight Board to monitor government actions for evidence of intrusions on Americans' rights, the effort to follow through has "been dormant for more than three years." Congress, the report says, still hasn't reorganized its committees to meet the modern challenges of terrorism. The executive branch, it reports, has not made the director of national intelligence "the driving force for intelligence community integration that we had envisioned." Lee, Kean and their experts say the "are not satisfied with improvements to [the Transportation Security Administration's] screening capability" to detect explosives and other threats to the aviation system. They say the federal government needs to deploy "biometric" systems that can track when foreign nationals leave the nation — not just when they enter. They also fault delays in establishing national standards for "the issuance of birth certificates and sources of identification, such as drivers licenses." Finally, the report turns to the issue of suspected terrorists who are still being detained at Guantanamo Bay, Cuba, and states that "we are concerned that the issue of prisoner treatment has become highly politicized. This is not good for the country or our standing in the world. ... Congress and the president ... must decide on a comprehensive approach that spells out clearly the rules of evidence and procedures and the forums in which they will be applied. Congress should anchor these decisions in a firm statutory basis."